Big Happy Face Stress Balls - 4 Pc Set Only $6.95! Ships FREE! You are here: Home / Great Deals / Amazon Deals / Big Happy Face Stress Balls – 4 Pc Set Only $6.95! Ships FREE! Big Happy Face Stress Balls – 4 Pc Set Only $6.95! Ships FREE! Perfect to have around once school lets out! Also makes a great teacher’s present! 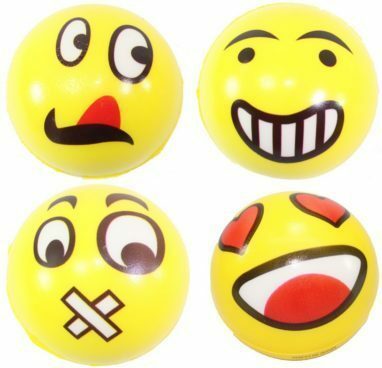 Order the Big Happy Face Stress Balls – 4 Pc Set Only $6.95! Ships FREE! Excellent for Stress Relief, Great for physical Therapy. Light and easy to carry. Size: 3″ diameter.